Please join our GIS staff and Trimble Certified trainers for a half-day session as we showcase Trimble, Esri and Laser Technology along with much more. Program starts at 9:00 a.m. ends at 3 p.m. 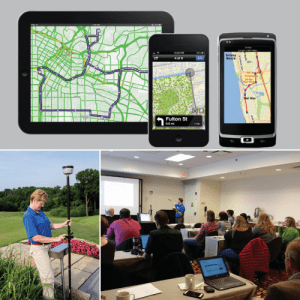 The MGIS Mapping and GIS Product Showcase introduces new products, software, while we share the latest Tips and Tricks and News for Mapping GIS Professionals. Make sure you register and attend this event to participate in our drawings for a few cool give-a-ways including a $25.00 Visa Gift Card! Register today for this half day event – seating will be limited. I unfortunately will not be able to attend this event. You may remove my name from the attendance list. Thank you Chris for the heads up. Sorry you will miss this event. We do have other events coming soon to KS, NE, MO and WI, so if your in the area – please sign up.